Rich, creamy no-bake cheesecake that comes together in a flash in your blender or food processor. The cheesecake is blended with juicy strawberries then layered on toasted graham cracker crumbs, topped with more juicy strawberries, and a dollop of whipped cream with a strawberry on top. Today is National Cheesecake Day! I’ve joined together with fabulous food bloggers around the globe to help celebrate this fabulous dessert! Roxana from Roxana’s Home Baking organized the celebration and invited me to participate. I don’t think I’ve ever turned down a chance to eat cheesecake, so I was happy to join in the fun. Since it’s summer and life is busy, I decided to make an easy no-bake cheesecake recipe for National Cheesecake Day. Lately the strawberries at the market have been so sweet and juicy, I couldn’t resist making a strawberry version of Donna Hay’s Blackberry Cheesecake Pots that I posted several years ago. I used my toaster oven to toast the graham cracker crumbs, but if you didn’t want to heat up the house, you could skip that step. You could also substitute crumbled shortbread cookies as the base. I thought about going to Trader Joe’s and buying their Lemon Cookie Thins, but never made it to the store, but I’ll have to try that next time. You could easily pick up the ingredients at the market today and serve this as dessert tonight. It’s a delicious, easy way to celebrate National Cheesecake Day. Combine crushed graham crackers and butter in a small bowl or Ziploc bag. Spread on baking sheet. Toast in the oven 3–5 minutes until crumbs start to brown. Cool to room temperature. In a small bowl, combine sliced strawberries and 1/4 cup sugar. Set aside for at least 30 minutes until the strawberries release their juice. Process the cream cheese, 1/4 cup sugar, cream and vanilla in a blender until smooth. Add 1/2 cup of the strawberries with juice, and pulse to incorporate in to cheesecake mixture. Divide the graham cracker crumbs into four serving dishes, reserving 1 tablespoon for garnish. 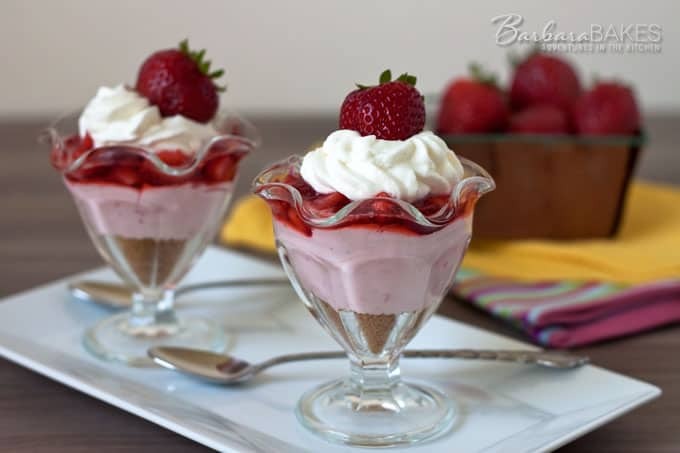 Divide strawberry cheesecake mixture evenly between the dishes. Top with remaining strawberries and juice. Refrigerate for 1 hour or until firm. 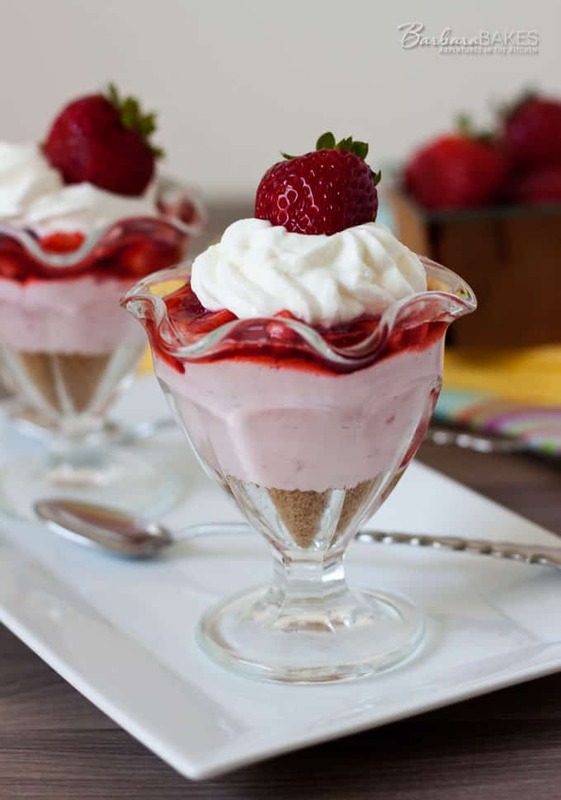 Serve garnished with whipped cream, graham cracker crumbs and a strawberry. Now it’s your turn to celebrate. 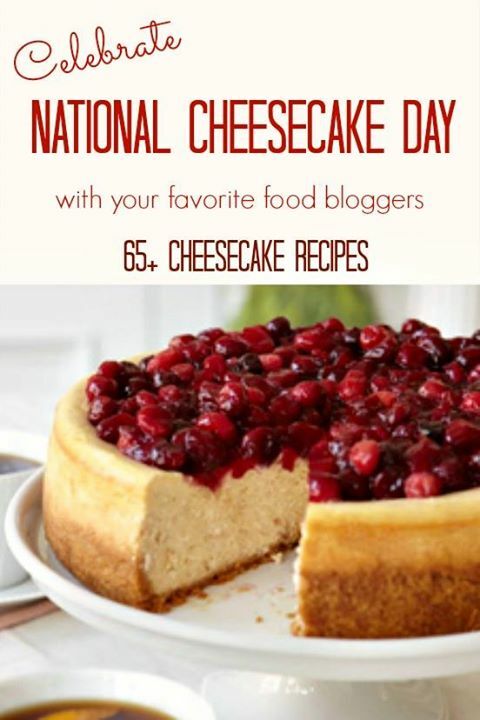 Visit some or all of the participating sites below and whip up a cheesecake today. Or, pin the recipes to save them for your next special occasion. Never mind, I see that you use the regular oven in the recipe but mention toaster in the narrative. These are gorgeous, Barbara! I love the flavor combo of cheesecake and strawberry, it’s a favorite of mine for sure! Pinned! What a lovely simple, but impressive dessert! I love that you toasted the graham cracker crumbs for that added touch!